The president’s rapprochement with Raúl Castro is a crucial step in overcoming the long history of US intervention in the region. As the plane descends to Tocumen International airport in Panama City, passengers look down on dozens of ships anchored at the mouth of the Panama Canal, awaiting their turn to traverse the locks from the Caribbean to the Pacific side. Until President Jimmy Carter signed the Panama Canal Treaty in September 1977, ceding eventual control back to the Panamanians, the militarized Canal Zone was the pre-eminent symbol of US imperialist arrogance in the region, and a festering insult to the sovereign dignity and independence of Latin America. Playing host to the 7th Summit of the Americas last week, Panama became the historic venue for the United States to redress another longstanding affront to Latin America—its half-century-old Cold War policy toward Cuba, which Colombian President Juan Manuel Santos referred to as “a blister that was hurting the region.” When the plane carrying President Raúl Castro landed on April 9 for the two-day summit, it marked Cuba’s formal reincorporation into the inter-American system—and the official end of Washington’s self-defeating efforts to isolate Cuba. Two days later, when Castro and Barack Obama shook hands and sat down for the first private meeting between a US and Cuban president since the 1959 revolution, they officially buried the perpetual hostility of the past and opened a new future of civility and dialogue between Washington and Havana. At their unprecedented bilateral meeting, the two presidents discussed the next steps to achieving the historic goal they had both announced last December 17—restoring diplomatic relations. Their agenda included Cuba’s status on the State Department’s notorious blacklist of countries that support international terrorism. 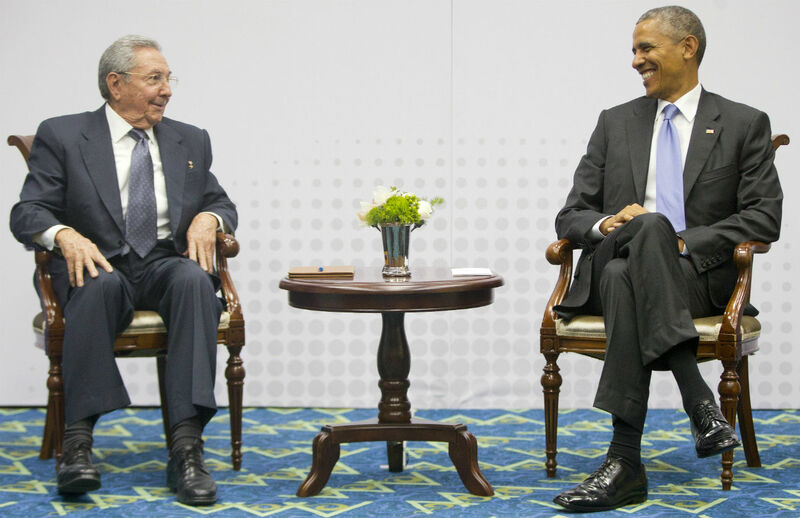 Clearly they made progress; only three days after returning from the summit, Obama notified Congress that Cuba, after 33 years, was not a terrorist state and would be delisted. With that long-awaited and long overdue decision, the United States and Cuba now find themselves on the verge of setting a date to reopen fully functioning embassies in Washington and Havana. Exactly 54 years since the CIA led a brigade of exiles in a paramilitary assault on the island at the Bahia de Cochinos, the moment of rapprochement and reconciliation between Washington and Havana has finally arrived. Cliché as it was, the summit logo of two colorful doves exchanging an olive branch in flight captured the diplomacy of peace undertaken in Panama. Obama administration officials deserve much credit for the success of the summit. But truth be told, the opportunity to engage Cuba in Panama was foisted on the White House by the rest of Latin America. Three years ago, at the 6th Summit of the Americas, hosted by President Santos in Cartagena, Colombia, the region’s leaders made it clear they would boycott another meeting without Cuba’s inclusion. Last September, Panamanian Foreign Minister Isabel Saint Malo de Alvarado flew to Havana to inform Raúl Castro personally that Cuba would be invited for the first time since the summit meetings began in 1994. As Air Force One arrived in Panama at 7:35 PM on April 9, Secretary of State John Kerry held a preliminary two-hour meeting with his Cuban counterpart, Bruno Rodriguez, on the embassy issue. (Their discussion presumably included Kerry’s reported interest in coming to Havana to hoist an American flag and change the plaque on the US Interest Section building to read “Embassy of the United States” once the two sides had finalized negotiations to inaugurate diplomatic ties.) The next evening, with dozens of Latin American presidents looking on, and UN Secretary General Ban Ki-moon at their side, Obama and Castro broke the ice with a long, energetic handshake and a bit of chummy chit-chat at the opening banquet reception. That “long and complicated history” between Cuba and the United States, as well as between the United States and the rest of the region, intruded in many ways during the summit—and at many levels. When official members of the Cuban government’s civil society delegation arrived in Panama, for example, they found Felix Rodriguez—the retired CIA operative whose claim to fame is his role in the October 1967 capture and execution of Che Guevara in Bolivia—participating in the civil society events. The Civil Society Forum—one of several ancillary sets of meetings that included a CEO summit hosted by the Inter-American Development Bank, a Youth Summit, and an unofficial grassroots “Cumbre de los Pueblos” (Summit of the People)—became decidedly uncivil as supporters and opponents of the Castro government clashed ideologically, verbally, and physically. Cuba’s outrage at the Rodriguez “provocation” contributed to a well-organized effort to dismiss, and intimidate, all of the members of the dissident civil society groups as “mercenaries” in the employ of the US government. As some of those anti-Castro civil society organizations attempted to lay a wreath at a monument of José Martí near the Cuban Embassy in Panama City, they were physically assaulted and chased away. In the outer lobby of the Hotel El Panama, where I was staying, fighting almost broke out again, as pro-Castro representatives briefed journalists on their petitions to summit organizers to eject the “mercenaries” from the conference; inside, a group of un-credentialed pro-Castro activists barged their way into a salon where civil society delegates were meeting, took over the room, and prevented the proceedings from continuing. At the presidential level, the discourse was far more diplomatic, but, at times, no less accusatory. In what was billed as his first stop after arriving in Panama City for the summit, Venezuelan President Nicolás Maduro held a solidarity rally attended by several hundred members of the “Cumbre del Los Pueblos” in Chorrillo—the working-class neighborhood of Panama City bombed by the US military during the December 1989 US invasion to remove Gen. Manuel Noriega from power. The supposed “surgical operation” killed an estimated 300 civilians; it represents the last use of US “gunboat diplomacy” in the region. As such, the symbolism of the venue was not lost on Maduro’s supporters at home, or on the crowd in Chorrillo. Many activists had come from Venezuela bringing caps, T-shirts, and banners bearing the slogan “#Obama Repeal the Executive Order”—a reference to the US president’s March 10 decree declaring Venezuela to be a “security threat” to the United States and sanctioning seven intelligence and security officers for human rights violations. The language of Obama’s decree is generic to all emergency orders involving sanctions—even minimal ones banning foreign officials from traveling to the United States and conducting financial transactions. But Maduro cast the decree as US preparations to “defeat my government.” With the audience chanting “Gringo-home! Gringo-home!” Maduro accepted a box of petitions from Panamanian Student Association representatives calling on the US president to rescind the directive. “I have 14 million signatures to give to Obama,” Maduro told the cheering crowd. Still, Maduro peppered his plenary remarks with condemnation of US “imperialism” and received at least verbal support from other countries. Besides Maduro, a number of Latin American leaders—among them Nicaragua’s Daniel Ortega, Ecuador’s Rafael Correa, Bolivia’s Evo Morales, and Argentina’s Cristina Kirchner—excoriated past US interventions in Latin America and warned of the threat of future intervention against Venezuela. “I always get a history lesson,” President Obama responded with humor. Anti-US rhetoric, he pointed out, would not solve the pressing problems of the region. Moreover, his administration wanted to move forward, not face backward. Ending more than a half-century of hostilities toward Cuba in favor of a new era of positive engagement would be part of that process. With Washington and Havana now positioned to officially restore normal diplomatic relations, the long-term future of US-Cuban relations appears far brighter. In the short term, the debate over Obama’s dramatic decision to seek a rapprochement with Raúl Castro will play out during the next 45 days—the designated allocation of time for the US Congress to deliberate on Obama’s official determination to remove Cuba from the terrorism list. By June, the legislative strength of those who support a future of engagement versus those who seek to reinstate a policy of hostility toward Cuba will become far more apparent. Beyond its bilateral impact, that new reality in US-Cuban relations will go a long way toward changing perceptions of overall US relations with Latin America. “This shift in US policy represents a turning point for our entire region,” Obama suggested during the summit in Panama. By “writing a new chapter” in the long and complicated history with Cuba, the president can also begin a new historical narrative in US relations with the hemisphere.